The best Steinway pianos ever made were built between 1890 and 1940, commonly referred to as Steinway’s “Golden Era”. We are proud to be the preeminent rebuilder of these wonderful Golden Era gems. 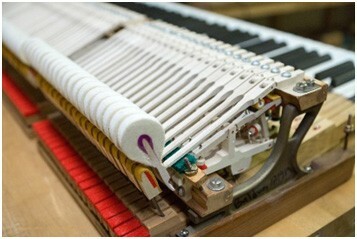 Steinway & Sons today focuses on semi-automated manufacturing of thousands of new Steinway pianos. In contrast, we devote all of our resources towards one-by-one piano restoration. In rebuilding thousands of Steinway pianos this way over the past four decades, we have perfected our processes to the highest level in the industry; no other company has invested as greatly as we have into the rebuilding of the best possible Golden Era Steinway pianos. Our rebuilt Steinway pianos are the finest Steinways available because we are committed to using authentic parts and craftsmanship, closest to what Steinway used 100 years ago. When our parts and techniques are applied to a Golden Era Steinway, the piano regains all of its former glory and becomes a truly unrivaled, world-class Steinway piano. Learn more below. the old Steinway magic in a way that would delight Theodore. Our driving passion is to perfectly restore Golden Era Steinways to all their former glory. Over 40 years we have perfected our proprietary techniques and specialized equipment to master every facet of piano design and mechanics. These techniques and equipment are skillfully applied by our world-class piano craftsmen to create, one-by-one, Golden Era Steinways that have regained their entire former splendor and stand out as truly unrivaled Steinway pianos. We built our own piano rebuilding factory, which contrasts with nearly all other piano restorers who substantially ‘farm out’ their pianos to a medley of independent contractors of varying expertise. When different rebuilders restore the same pianos the results vary greatly. Authenticity, experience and consistency are what make our rebuilt Steinway pianos stand out from all the rest. Steinway & Sons once manufactured magnificent cast-iron harps (the heart of a piano) in their own New York foundry, but that foundry is long gone. 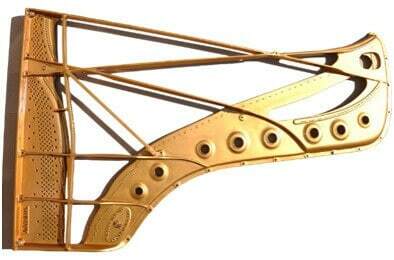 Golden Era Steinways have those original NY foundry harps but new Steinway pianos do not. This is one of the reasons that new Steinways do not have the special Steinway “soul” that defines the Golden Era Steinway. Renner actions are the most precise and responsive in the market and are the preferred actions for most pianists. 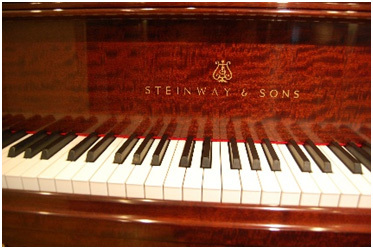 Steinway & Sons uses them in their new Steinway Hamburg pianos, and we use them as well. And since each Steinway piano works best with only one of many possible combinations of action parts, our Renner-trained technicians custom-select and perfectly fit just the right Renner parts for each Steinway action that they rebuild. Renner parts cost more, so many rebuilders don’t use them, and those that do use them often don’t have the expertise to custom-select and fit them as we do. Hand-wound bass strings are essential to create a powerful bass sound. Less expensive, machine-wound bass strings used by many rebuilders do not produce the dramatic depth of sound that typifies our rebuilt Steinways. 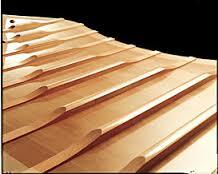 White spruce is the preferred soundboard material for practically every high-end piano manufacturer, and for us. Our soundboard material, supplied by Bolduc, comes from Adirondack eastern white spruce trees, the finest in North America. Careful culling and seasoning of this wood yields premium soundboard material with unsurpassed tonal quality and durability. Steinways restored with other, lower cost soundboard materials do not perform as well as pianos that have soundboards made from premium white spruce. An exact fit of the carved soundboard to the inner cabinet rim, which we carefully achieve in every piano we rebuild, is essential for maximal sound projection. 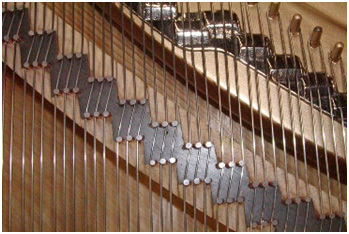 An imprecise fit, found in many other rebuilt Steinways, causes the sound to be weak and muffled. The hard rock maple that we acquire from Bolduc yields bridge caps that are unmatched in purity and strength. 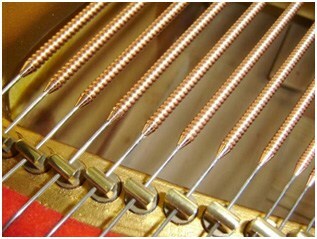 Bridge pins set in this superior, rock-solid material provide solid anchors for the piano’s strings, which is essential for their tones to be steady and true. Steinways restored with other, lower cost bridge caps tend to produce tones that are imperfect and less stable. Considerable effort is put into our hand-rubbed lacquer finishes, and the superior result is clear. With a quality not found in other pianos, our refinished piano cases have a rich, satin luster that compliments every other fine detail in our pianos. The rich finish is magnificent and fully worth the extra effort it takes to achieve. It is yet another one of the features in our rebuilt Steinways that distinguish them. The craftsmen who install and calibrate the actions and dampers in our rebuilt pianos are more highly trained and experienced than most others in the field. The tuners who ensure that our pianos are properly voiced are invaluable in creating a polished, finished product. The dedication and attention to detail by these specialists results in the highest quality rebuilt Steinways in the industry. 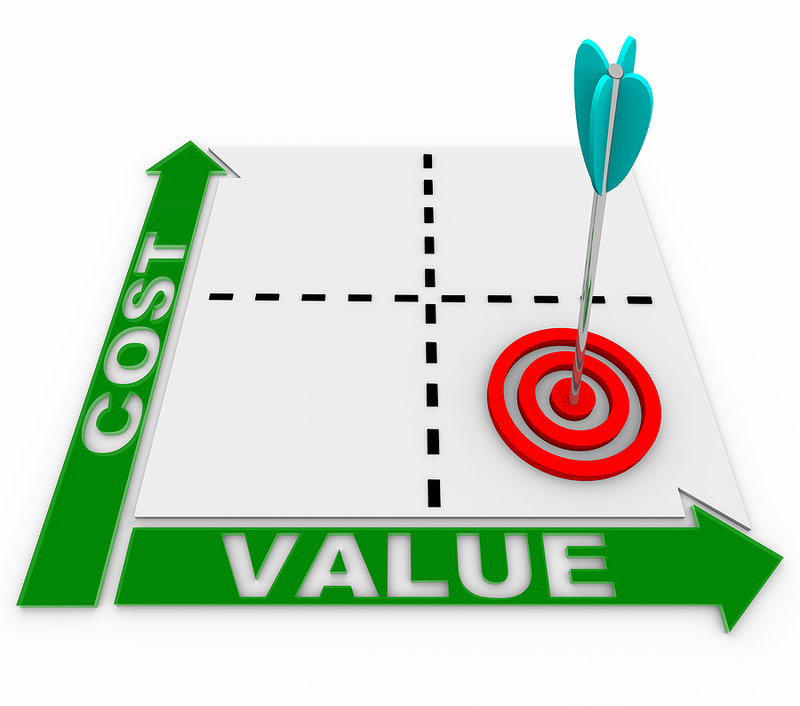 The efficiencies that we achieve with our volumes and refined manufacturing processes enable us to charge very competitive prices even though we provide the highest quality. Rebuilt Steinways sell for 20 – 30% less than the price of a new Steinway, and depreciate at a slower rate than new Steinways. As such, our fully rebuilt Golden Era Steinways are not only superior instruments, they are more affordable than new Steinway pianos and a much greater value. 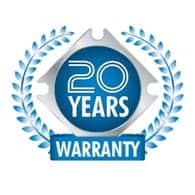 Our 20-year warranty is a testament to the high quality of our work. 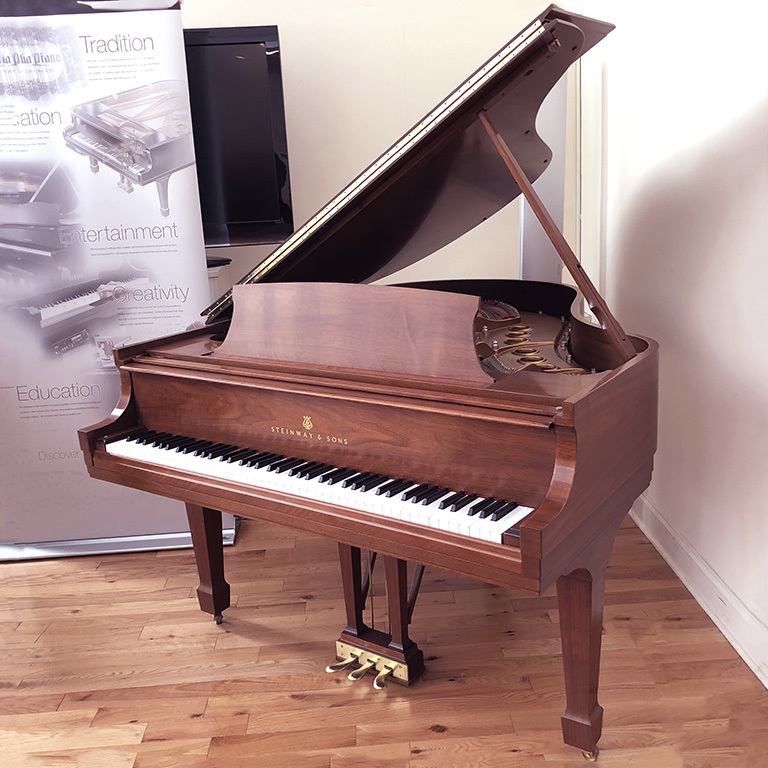 Steinway pianos that we rebuilt 20 years ago are every bit as good today as the day they were rebuilt, and for the nearly 40 years that we have been in business, we have not had a single substantial warranty claim! 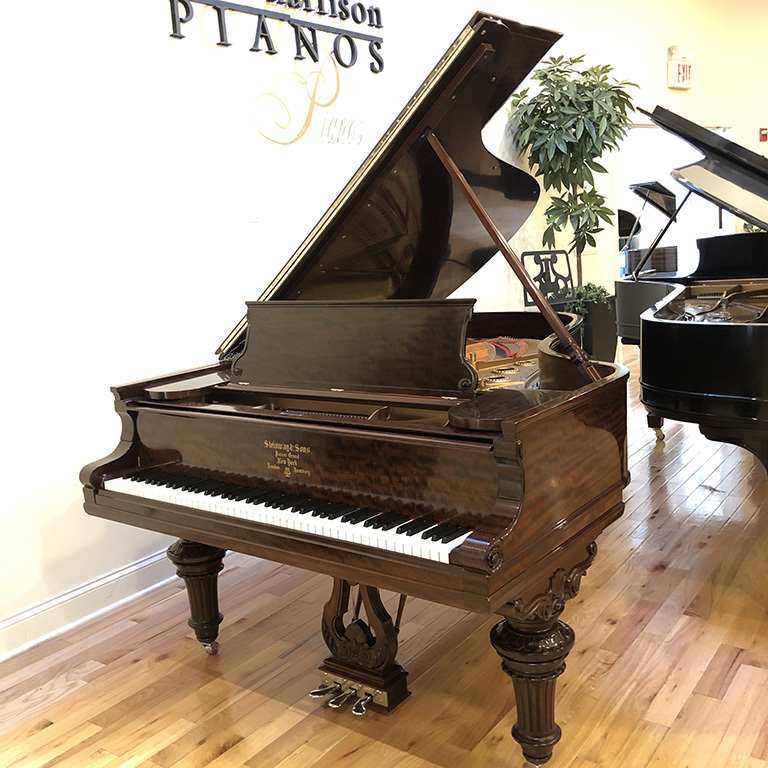 Furthermore, our size and financial stability assures that we will be here to serve our clients long after many other piano rebuilders have moved on. 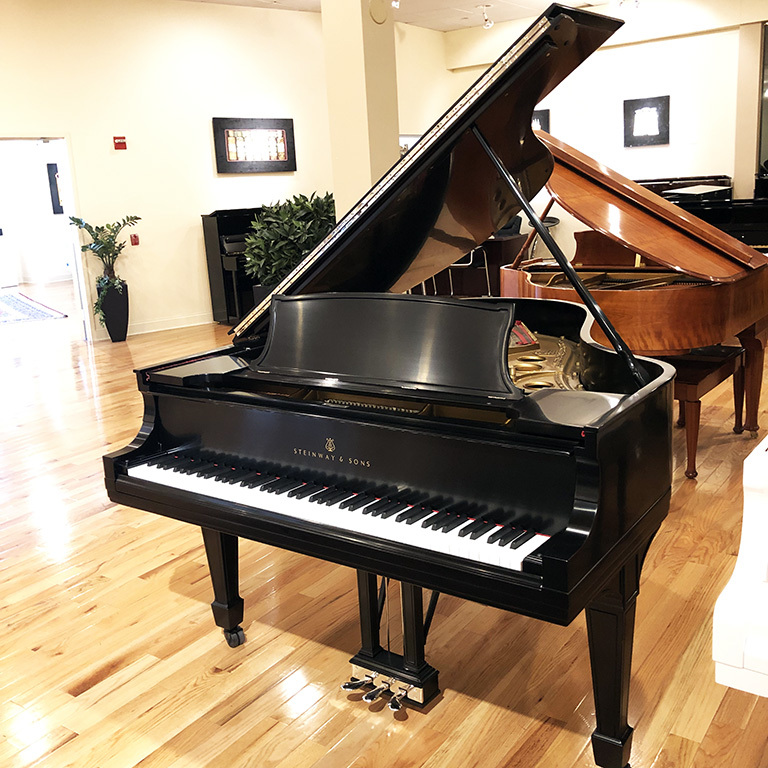 Compare this to the record of Steinway & Sons; according to their last financial statements, their warranty claim expenses averaged over $1 million per year. Our modern piano rebuilding factory is home to our expert craftsmen who apply authentic techniques, parts and materials to painstakingly transform worn-down Golden Era Steinways into glorious world-class instruments that are the best Steinway pianos available. 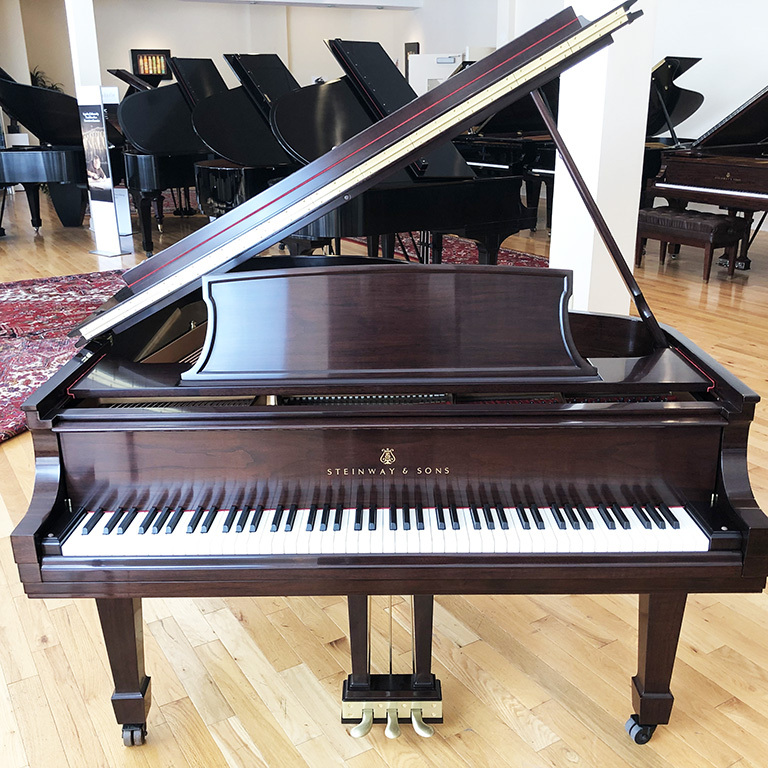 Our rebuilt Golden Era Steinways are showcased alongside nearly new Steinway pianos and next to the worlds most acclaimed and prestigious new pianos such as Bosendorfer, C. Bechstein, Fazioli, and Yamaha CF. 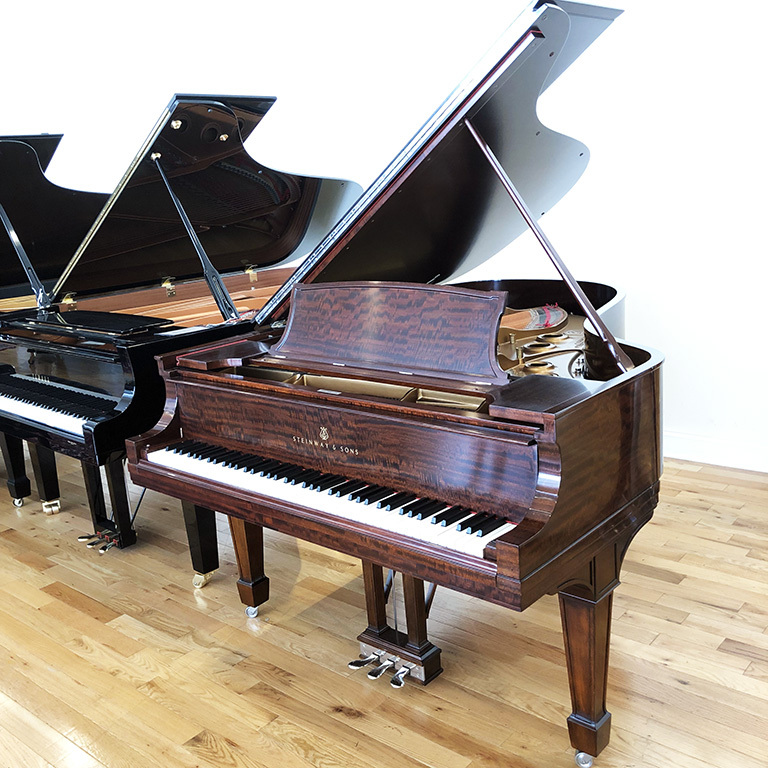 Our showrooms are the only place where all of these great pianos can be played and enjoyed side by side. The efficiencies we’ve achieved with our volume and refined manufacturing processes enable us to charge very competitive prices, which are well below the cost of new Steinway pianos and comparable to prices charged by lower-quality piano rebuilders.